He began in the trade in different workshops in Huesca. He studied at the Confectionery Guild School of Barcelona (EPGB), while working in different pastry shops in the city. A year later he joined the staff of teachers. 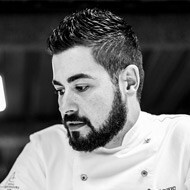 He participated in various competitions and in 2011 becomes Spain’s Best Master Artisan Chocolatier (Lluis Santapau Trophy), the highest honor for Spanish chocolatiers. A few months later he joins the Chocolate AcademyTM where in addition to teaching, he is Chocovic’s Chef Chocolatier. Raul Bernal represents fantasy and fun creativity, starting from study and technique. Pastry is magic, it is illusion, a celebration, joy. That is how I understand it. Surprising without losing my head, with a base, a rhetoric, a technique.